This French version of Don Carlos is not visually startling. 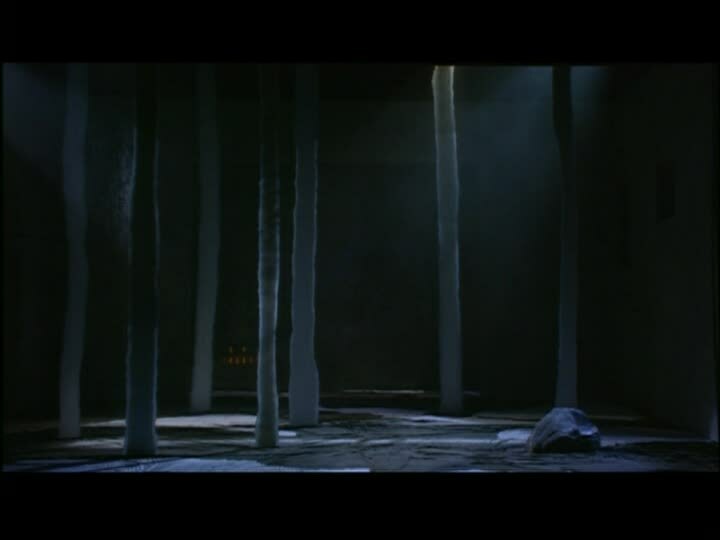 The forest in Act I looks like a forest, tombs resemble tombs, and so on. The color and style of the crowd’s clothing in the auto-da-fe scene, in combination with the vaguely classical niches at either end of the stage evoke, one assumes on purpose, 16th century paintings of biblical episodes. Eboli and her ladies in the garden in Act II appear to be drinking mimosas, but I suppose if you put a mace to my head – or near my head – and demanded to know what Eboli and her ladies might refresh themselves with in the garden, if anachronism were not an issue I suppose mimosas are not insane as an answer. Also, this is the second production of this opera that I have seen in which the snow/icy ground retracts away like a pulled-back sheet at the end of the Fontainebleau scene. Why is this effect so difficult to get used to? There were one or two visual touches that probably bear mentioning. One, at the end of the Fontainebleau section, when Elisabeth is led off to be married to Philip, they put her on a real live horse. So, if we are playing Opera Bingo, and there is a square for Horse, this is one of your options. And after all, how often do you get to see the soprano sing her part of the Act I finale while, you know, on a horse? I bet that’s either great fun for the singer, or – depending on whether you like being on a horse and the temperament of the horse – one of those things that you don’t get paid nearly enough for. Or maybe once you’re an international opera star nothing they ask you to do is surprising any more. There were a few moments of stage direction in the opening act that I didn’t love – for example, Elisabeth staggers onto the stage so exhausted from getting lost that Thibault is practically carrying her; later, after she says “oui” to the marriage with Philip, she faints; not long after this she faints again while propped up on the horse and has to be held in place. It seemed a bit much – or rather, it seemed a little too 19th-century for me. Then again, Elisabeth fainting later, in Act IV, has never annoyed me, so I don’t know why this early episode does. Hell, maybe she was just dehydrated from all the hunting and being lost and lighting of fires and what not. Next. Insofar as there is a List of Moderately Interesting Things That Can Happen On Stage While Philip Sings His Act IV Soliloquy (as yet, based on my own opera-watching experiences, the list is 1. Nothing and 2. Eboli is there and sleeps through it), we have another item to add to it, which is 3., What appears to be merely rumpled bedclothes on Philip’s bed turns out to be Elisabeth, asleep in her formal dress with her hair still up. She sits up, looking abstracted, as if she is still asleep, does not react or register anything going on around her, and wanders away like a ghost. I guess either she left her pajamas in Paris, or the 16th-century Spanish court is even more formal than we thought. 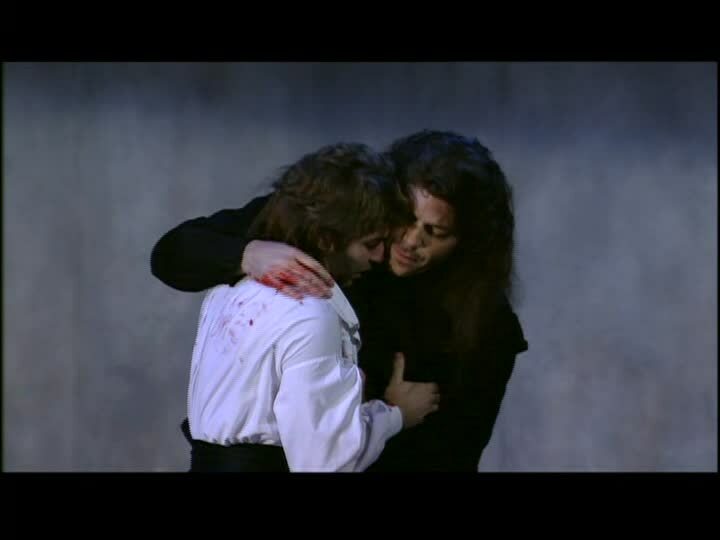 Finally, and unrelatedly, I kept getting distracted by the waviness and general luxuriance of Thomas Hampson’s (Posa’s) wig. If Elisabeth gets a horse, perhaps Posa ought to get a motorbike, so that at least once, we might see this magnificent mane streaming out behind him. Carlos could ride in the side-car; they could do “Dieu, tu semas dans nous ames” while driving in circles around Charles V’s tomb. I was listening to the audio version of this performance a while back, and my impression then was that I had never heard the role of Elisabeth sung with the same ease and beauty that Karita Mattila imparts to it. The DVD version confirms me in this opinion – she really is wonderful. That big, shining sound she produces when Elisabeth is ecstatic with love (the first duet with Carlos) or resigning herself to the inevitable (“Toi qui sue le neant”) is amazing. It seems to just pour out of her. I have heard some performances of this role that dug into the character differently, but I have never heard one that sounds quite like this. There are no slouches as far as the rest of the cast is concerned either. The abovementioned Act IV aria of Philip’s, which is one of my favorite parts of this opera, was nicely done by José van Dam, with more than able assistance from whoever was playing that solo cello. Thomas Hampson is not at all upstaged by his hair – if you have seen this production, you know that this is no idle compliment – and Waltraud Meier is as dramatic an Eboli as you could wish. That said, my favorite bits of this remain those with Mattila in them. The stage direction (all the fainting, and a few other little things) renders Elisabeth a little more conventional and less “young woman agonizes over what she very much wants but restraints herself because deep down she has a slightly terrifying sense of duty” than some other performances I have seen, but this impression is conveyed by what you see, not what you hear. I was of two minds about Pappano’s conducting as I listened to this. There were moments when I did not hear the score as clearly as I wanted to, e.g during my favorite key change in “o bien perdu,” where the timing felt less precise than usual, as if the orchestral transition and the vocal one from one section of the number to the next, got blurred, or didn’t happened in quite the way I expected. Along similar lines, the way the combined orchestral and stage direction handles Philip and Elisabeth’s visual entrance in the first San Yuste scene was odd: there is a musical build-up in the score that normally accompanies Carlos seeing them and being stricken, but here, they’re at the rear of a procession and neither we nor Carlos see them until the music has calmed down a bit, which felt off to me. That said, there was something elegant and urgent and precise about the orchestral music at the beginning of the Fontainebleau scene, before Elisabeth and Thibault show up. During the Philip/Posa scene in Act II, some combination of Hampson, Jose van Dam and Pappano’s conducting made me feel as if had not heard this section quite like this before. Also, I switched the subtitles to French (sung French sounds like vowel porridge to me, but I can read subtitles) and it’s kind of embarrassing the difference this makes, especially in ensembles like the Act IV quartet – together, this and the performances/conducting and I suspect a bit of the video direction as well imparted a clarity to this section that I don’t always hear. That apparently nicked artery of Posa’s sounded like one of those desktop zen fountains even on the VHS version. I think you have just outlined an International Scale of Operatic Stage Gore – it runs from whatever the minimum is to Desktop Zen Fountain at the far end. I imagine that some director, if they haven’t done so already, will eventually push that envelope with something more like an hommage to Lincoln Center. « And apparently wordpress has decided to mess with my reader settings again . . .